2. Mix together the almond meal, flaxseed meal, Natvia (Xylitol) and nutmeg into a mixing bowl. We use a KitchenAid Stand Mixer to do our mixing that you can get here, as it free’s us up around the kitchen. But you can mix by hand or with a hand mixer. 3. Add the melted butter and egg and mix well (if you’re using a stand mixer or hand mixer, select slow). 4. Spoon the mixture into a 9.5 inch Pie Dish and press into an even layer across the base and up the sides. 5. Bake in the oven for 12 minutes until the base is firm. If the base starts to rise from air bubbles, prick it with a fork and gently press down. Set aside to cool slightly. 1. Reduce oven to 160C/320F. 2. Scrap the seeds from the vanilla bean and discard the pod. 3. In a bowl whisk together the eggs, egg yolk, vanilla seeds and natvia (Xylitol). 4. Add the whipping cream and mix well, before pouring through a fine sieve to removed any larger vanilla bean pieces. 5. Pour mixture into base and gently place in the oven. 6. Bake for 25 minutes, or until the custard is just set and there is a slight jiggle when moved. 7. Sprinkle with a pinch of nutmeg and place in the fridge for at least 30 minutes to set. 8. Cut into 12 even pieces and enjoy. 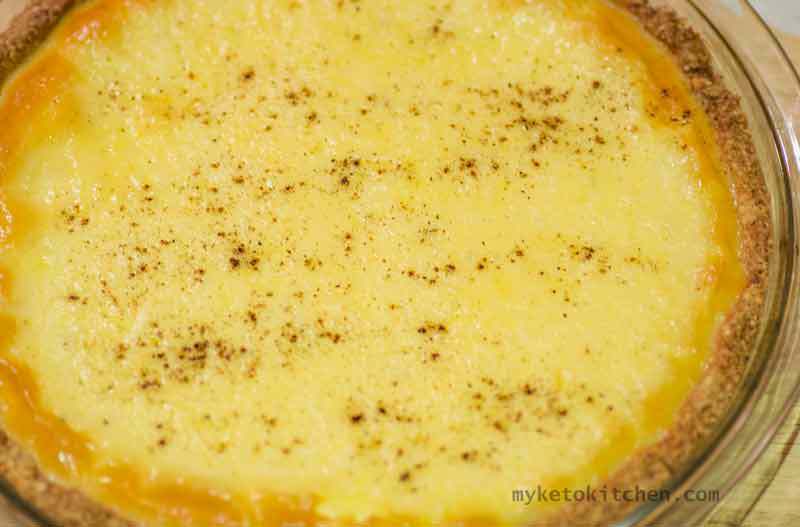 If you want to make a larger Low Carb Custard Tart, simply adjust the serving amounts in our easy to use recipe card below. The measurements and ingredients will adjust themselves and all you have to do is follow the method, keep in mind that the cooking time will also need to be adjusted.